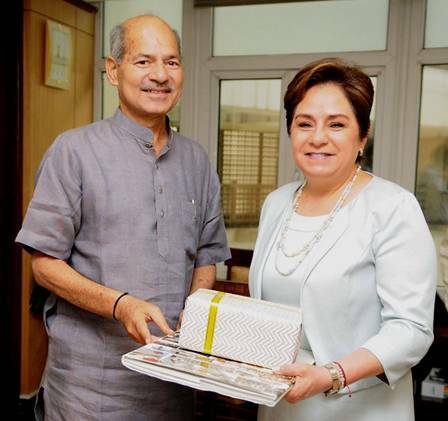 New Delhi: United Nations Framework Convention on Climate Change (UNFCCC) Executive Secretary, Ms. Patricia Espinosa, met the Minister of State (Independent Charge), Environment, Forest & Climate Change, Shri Anil Madhav Dave, here today. During the meeting, Shri Dave highlighted India’s Science Express Climate Action Special (SECAS) train being run as an ongoing climate change awareness programme for various sections of society, especially students. The Environment Minister also emphasized the importance of sustainable lifestyles in addressing the climate change issues. UNFCCC Executive Secretary praised India’s actions as an example for many other countries. She emphasized the need to showcase these efforts on international platforms. Earlier, in a meeting with the Secretary, Environment, Forest & Climate Change, Shri Ajay Narayan Jha, Ms. Espinosa acknowledged India as an important partner in pursuing the agenda of climate change and expressed interest in engaging with Indian institutions playing a major role in climate action in India. She dwelt upon the synergy between the Sustainable Development Goals and climate actions. Shri Jha highlighted India’s actions to address climate change, including the goals to reduce the emission intensity of its GDP by 33-35% from 2005 levels by 2030, increasing the share of non-fossil fuel sources in the electricity mix, afforestation efforts and world’s largest renewable energy programme being pursued in India. He also underlined the climate change governance structure to monitor climate change actions in India, which includes PM’s Council on Climate Change chaired by the Prime Minister and Executive Committee on Climate Change, chaired by Principal Secretary to Prime Minister. The issues of adequate means of implementation including climate finance, capacity building and technological support to developing countries were also flagged during the meeting. It was also highlighted that the core principles of equity and CBDR-RC need to be operationalized in the Paris Rule Book. Ms. Espinosa is on a two-day visit on April 18-19, 2017. This is the first visit of UNFCCC Executive Secretary to India.